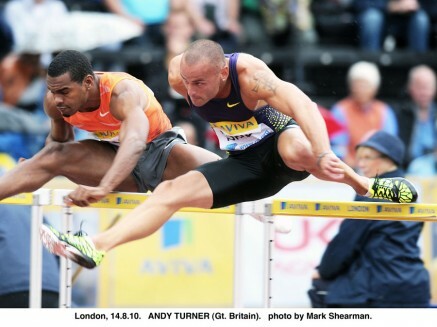 European & Commonwealth 110mH Champion Andy Turner (GBR) dominated a world class 110mH field to win the Kingston International in a time of 13.28 secs, just 0.01 secs outside his personal best. Leading from the halfway stage Turner got the better of former Olympic & World Champs silver medallist Terrence Trammel (USA) with Dwight Thomas (JAM) 3rd and World Champion Ryan Braithwaite (BAH) 8th. Olympic finalist Rosemarie Whyte (JAM) returned to form with an excellent 2nd place finish in a high quality women’s 400m. The Bert Cameron coaches athlete clocked 51.15 secs behind Novlene Williams (JAM) with Kaleisa Spencer (JAM) 3rd, Natasha Hastings (USA) 4th and Sanya Richards (USA) 5th. In his first race of the season after winter knee surgery Jamaica Record holder Jermaine Gonzales (JAM) ran an excellent 300m to come into the home straight with a winning margin but was caught a few meters before the line ending 3rd in 45.52 secs behind Chis Brown (BAH) and Renny Quoh (TRI). With another 2-3 weeks training Gunz will be back to his best form. Marvin Anderson (JAM) clocked 20.36 secs to finish 5th in the men’s 200m. Elsewhere Kimmari Roach (JAM) was 3rd in the B 100m race.